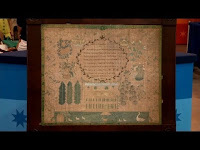 Homespun Stitchworks..... For the love of vintage: Web Appraisal: 1825 New Jersey Sampler ... a must watch for the surprise! 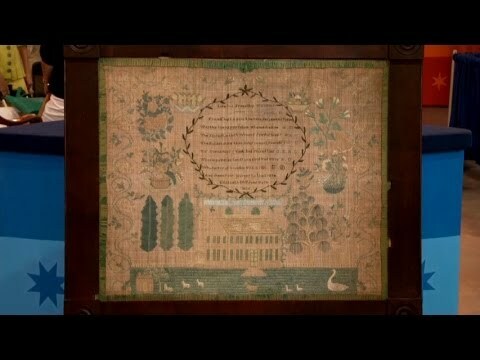 Web Appraisal: 1825 New Jersey Sampler ... a must watch for the surprise! As I am in America I thought we would stay this way on this Saturday. Take a look at this amazing family heirloom and what a busy household with children found out. When a mother who had been handed down this stunning sampler from 1825 through her generations found when her son smashed the original glass of this sampler with a golf ball! She was upset and I am sure angry with her son until what was uncovered would never have been found! And as always Happy Stitching! What an extraordinary story, a lovely clip.